I’ve been told it’s commonplace to lie when you’re looking for a date online — it’s almost expected that you stretch the truth in some way: exaggerate your height, downplay your age or affect an affinity for film noir. 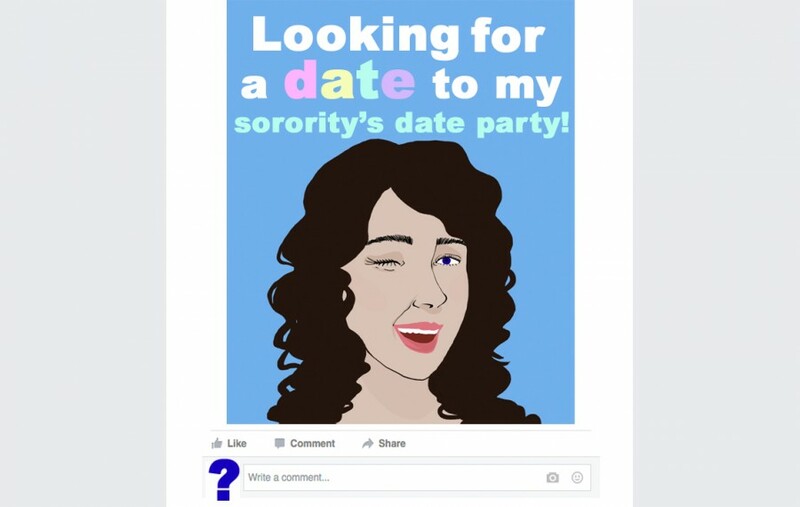 So when I went to UC Berkeley’s “Free & For Sale” Facebook group to find a date for an upcoming sorority outing, I said my previous date had fallen through. My friend Charlotte said it was a good way to not seem desperate — to tone down my circumstance. Charlotte has a boyfriend and knows the intricacies of social niceties. I don’t. There had been guys I’d thought about asking and guys I’d elaborately planned to ask. In fact, I determinedly executed every part of these plans except the actual asking. I was and am that awful combination of chicken and lazy, and so, four days before the impending date party, I was still dateless. I wasn’t that bothered. I could have casually invited a number of people — friends, male or female. I have no trouble attending events alone, especially when surrounded by the 130 nonjudgemental women of my sorority whom I see on a regular basis, a fair number of them without dates themselves. I knew this, and yet I had an inexplicable and indulgent urge to partake in the whole shebang: dress up and take pictures, go to dinner, then dance loose-limbed in someone’s arms until my high-heeled feet strained and blistered. I wanted a “date-date,” and I didn’t think that was too much to ask. For single sorority women looking for a date-party partner in crime, there are a number of options and potential flaws in each of these options. Besides the obvious minefield that is getting set up with a blind date, choices such as bringing a friend also raise a dilemma — you might be insinuating that you’re looking for something more. If you bring your romantic interest, you run the risk of making the relationship more serious than you want it to be. If you go stag, you might be judged or have less fun: There’s no one completing your pair, no one only there explicitly because you asked them to. Date-party politics are universally complicated (and more than a little ridiculous). And yet, in Greek party culture, where going out is almost completely controlled by the fraternities (providers of the venue, the alcohol and the music), you’re limited in where you can go and what you can do. Date party is a distinct break from this — it’s an opportunity for women to take initiative and have fun on their terms with whomever they choose. Considering this, I couldn’t believe that I, a feminist and go-getter, was pining for a date, floundering for someone to take. After class on a Monday afternoon, I found myself walking up to my house, wishing there was a way I could set myself up, take power into my own hands. As I entered the foyer, I realized that there was. Just inside the door, I sat down and I pulled out my computer. Then I did something potentially unheard of, with what could be argued as more room for risk and flaws than the above options combined: I put myself on the Internet. I thought that if I was going to do it, I may as well do it big, so I went to one of the most popular Facebook pages used by UC Berkeley students: Free & For Sale. With a fluctuating membership of more than 28,500 members, Free & For Sale operates as a Craigslist for students: a place to sell practically anything, make PSAs and reach out to the broader Berkeley community. I was in need of a date, and I suspected Free & For Sale could provide. I didn’t know what I was getting myself into, but I suspected I would find out, and at the very least, it would be a good story. The post was up, and there was no turning back. Now anyone who cared to could see that I was dateless. Within an hour, the post had 135 likes. By the second hour, it was at 214. Ten UC Berkeley students had messaged me, all men, respectfully offering their time Friday evening. The respondents were remarkably normal: a mix of fraternity men and guys looking to experience something they never had before. The 23 comments on the post were a mish-mash of my friends joking and endorsing me and people I didn’t know tagging their friends. I received texts and messages from my closest friends who wanted to know if it was a joke or a bet. When I told them it was real, they laughed and called me crazy. I was as fascinated watching people’s reactions as people seemed to be by the initial post. I felt powerful; I felt the thrill of being the sole hand that changed my situation so swiftly and definitively. My date party would certainly be different than I’d anticipated. By the next morning, I had 13 offers and the likes were climbing toward 400. I hadn’t chosen anyone yet, partly because I wanted a full day to have passed, but mostly because I hadn’t thought far enough ahead about how I would choose. I stepped out into the real world, still contemplating the unconventional decision before me. When attention turned from my own private postulations to the public sphere, it finally felt real. A classmate brought the post up in front of a group in my yoga class and an acquaintance asked me about it while waiting in line at Caffe Strada. Each time it happened, I felt a deep desire to lie and tell them it was merely the result of an odds-game gone bad. Instead, I told the truth. Their reactions were surprisingly positive, and yet I still felt exposed.The interactions made me feel as if I’d just been caught by a particularly judgemental friend on Tinder. Worse, I felt as if I were on an online dating network where I was the only one who had joined. I began to feel that my vulnerability, my singleness, had no place in the collective consciousness. That night, I looked through my messages and picked Joey. We had cool mutual friends and I liked his hair: I’m a sucker for the mountain-man type. He seemed like a guy I would have chosen for myself in person, so I chose him for myself online. Given the flurry of the build-up, the process was remarkably simple. In the few days preceding the date party, my friends took to calling Joey my “Free & For Sale date.” I was game, and when the date party came, I found that he was too. We toasted to Free & For Sale at the pregame and talked about the ridiculousness of it all evening. Each time I caught his eye, I laughed at the peculiarity of our situation. “Peculiar” could describe the entire week really: It was full of justifying, doubting and explaining my choice, but once the evening began, I blindly followed its progression. Joey could have been a great set-up or could have been a good friend I asked after class — he just happened to be someone who reached out on Free & For Sale. After a dinner at Berkeley Thai House and a pregame at a friend’s apartment that were both less awkward than I expected, we made use of the San Francisco venue’s gym-esque dance floor and grooved, jived, dipped and mostly just held hands and drifted around. He didn’t ask too much about why I posted looking for a date, understanding implicitly that it wasn’t something that would add or detract from the evening. He asked instead about my hometown, interests and passions. In the days after, my friends who were also in attendance said we looked like we were having the best time out of everyone. I got exactly what I wanted, blistered feet and all. Why not? My experience was positive: a testament to the worth in putting oneself out there, to the strength and humility that comes from embarrassment, and to the weird and previously untapped power of Free & For Sale to bring people together. It was the middle finger in the face of date-party politics — of fear, desperate tactics and bad dates.